Did we say used? Well, technically that's true, but this never sold CBR500R should be considered new. It has about 30 demo miles on it, so we've got it priced to sell. 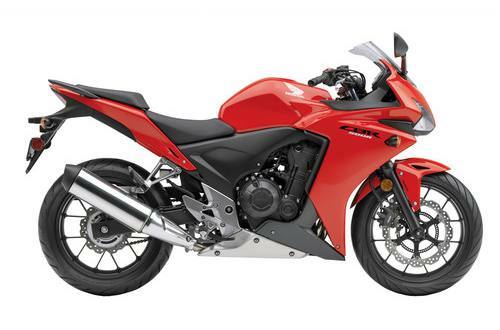 With the Honda Bonus Bucks we've applied to this model you won't find a nicer "new" CBR500R - With ABS - out there. Come in and take it for a test ride! With the introduction of the all-new CBR500R, Honda boldly redefines the middleweight class and infuses a whole new level of excitement for sport riders in search of superior value, along with great fun. The CBR500R delivers plenty of performance to sport riders, with its thoroughly modern, torquey 500cc P-twin DOHC engine wrapped in a great-handling chassis and featuring a full fairing spawned from Honda’s much-acclaimed CBR600RR and CBR1000RR sportbikes. Parallel Twin-Cylinder Engine: An all-new design, the CB500R is built with a high-performance, liquid-cooled 500cc DOHC parallel-twin engine that offers plenty of accessible power. Honda twins have always been some of the best motorcycle engines anywhere—reliable, efficient, and fun to ride. Sporting Heritage: The CBR500R offers a riding position that’s a touch more sporting, but not too aggressive, whether you’re commuting or carving the canyons. Honda Genuine Accessories: The CBR500R has a full line of available Honda Genuine Accessories including a sport screen, color-matched passenger seat cowl, and carbon-look accents. 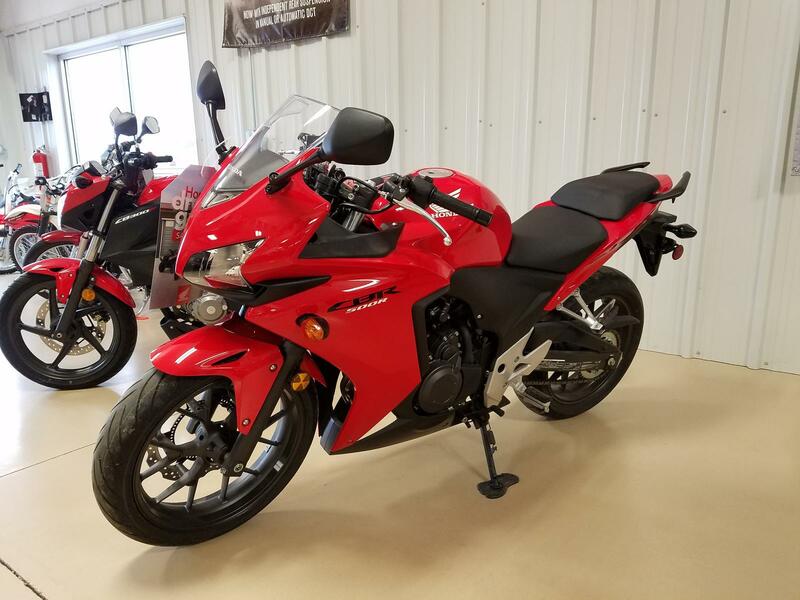 Practicality was never so much fun: Its combination of lightweight and rider-friendly engine makes the CBR500R a great choice for commuting, weekend rides, or just getting out and having fun. Plus, its lower seat height makes it easier to get your feet on the ground when you stop. DOHC Parallel-Twin-Cylinder Engine: Honda twins are famous for their versatility, and the new CBR500R engine is one of our best ever. Using the same piston bore size as our CBR600RR sportbike, the parallel-twin engine offers accessible performance across all RPM ranges. Programmed Fuel Injection (PGM-FI): Programmed Fuel Injection (PGM-FI) continuously monitors several variables to ensure the correct fuel mixture is delivered for the existing riding and atmospheric conditions for a crisp throttle response throughout a wide variety of riding. Stainless Steel Exhaust: Beautifully polished stainless steel exhaust is integrated with the rear footpeg set for clean, functional design. The length and diameter of the exhaust pipe contributes to useable power at all RPM ranges. Steel-Tube Frame: A motorcycle’s frame is the basis for its handling. A new take on a classic construction, the CBR500R’s diamond-shaped 35mm steel-tube mainframe ties to the engine with four mounts, offering a rock-solid foundation for a superior ride and handling. Pro-Link Rear Suspension: A sophisticated chassis with Honda Pro-Link® rear suspension, with 9-stage preload and 4.1 inches travel, gives you a comfortable ride over small bumps, while capably absorbing bigger bumps to increase riding comfort and handling. Disc Brakes: Front 320mm wave-style disc brake and 240mm rear provide strong stopping power. 12-Spoke Cast Wheels: Strong and stylish, the CBR500R’s aluminum cast wheels are easy to keep clean, look great, and are another feature that just makes sense. Supersport Styling: This aerodynamic bodywork also provides significant advantages in air management for added rider comfort, along with a low drag coefficient and effective cooling. Halogen Headlights: Twin 55-watt H7 halogen headlights and multi-facet reflectors on the CBR500R give the front end a unique look and also project plenty of light on the road for visibility. Stepped Two-Piece Seat: The new CBR500R offers a step seat with a low height. Perfect for around-town riding or winding roads, it also offers plenty of room for a passenger, and is specially designed to fit a wide range of riders. Rear Passenger Grips: Sturdy rear passenger grips offer a firm handhold for your passenger or tie-down points for smaller items. Anti-Lock Brakes: Available ABS on the CBR500R helps you make smoother, more controlled stops under less-than-ideal conditions.